This is an anniversary post of sorts. I mean, 10 Vintage Bliss Tuesdays already? I had to go back through them to see if I counted wrong. How quickly time seems to pass when you number your posts! Anyway, thanks for partying with me all these weeks. I love checking out the thrifty finds that people link up. I visited the Goodwill with my husband on the weekend. It was a quick trip round the store about half an hour before closing. Of course I concentrated on the housewares, as I always do. Looking through clothes just seems too overwhelming to me. So much crap to look through to get to the good stuff! I bought pairs of items, all matched in colour. Today I'm sharing a look at the first pairing. 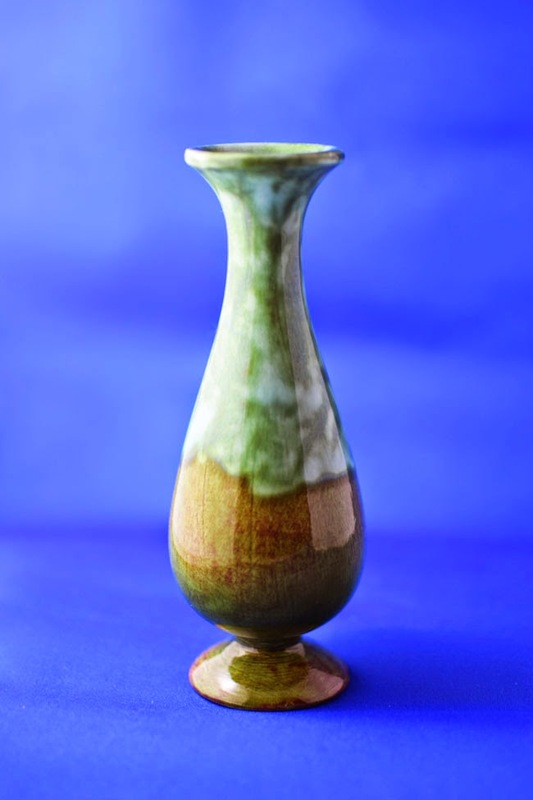 One, this cute little green and brown pottery vase. 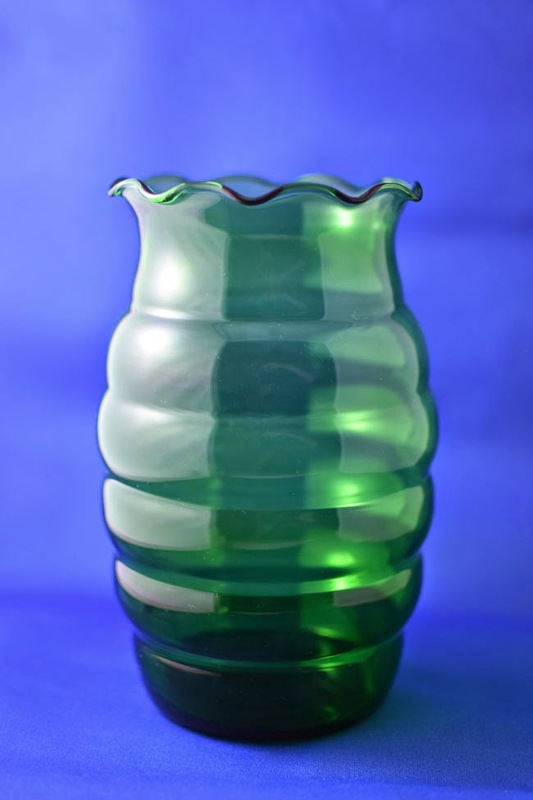 And, two, this larger green glass vase. I can't resist a pretty vase, even though I have a cupboard full of them. I have to start growing more flowers to fill them (in summer of course - right now the landscape is covered with snow and I'm still pretending it's very temporary). Do you have a specific colour of items that you tend to collect? I adore your green treasures! I love these :) I hope you have a terrific Tuesday! Nice finds and only half an hour to find them!! I'm like you, I'd like to look at the clothes because I know people find some great things, but I just can't be bothered - no patience for it at all!! Looking at the scarves is my limit!!!! I can barely look for clothes at Winners, never mind the thrift shops!! Ha, you're the same type of thrift store shopper as I am. It's always first to the housewares for me too, and I agree, there is too much crap in the clothing sections to wade through to find anything good. I love the vases you found, especially the green one. Flowers are in short supply around here unfortunately. ;) Actually they are completely absent except in stores. Have a great week! I need to get a colour scheme going in my kitchen so I can limit my purchases!! The green vases are beautiful. I buy mostly green items to keep. My favorite color is green. I am a sucker for pottery and would have picked up the first vase in a heartbeat! I am totally a sucker for pottery too!!! The second one looks kinda like a grenade, pretty cool. I never noticed that, but now that you mention it, I see the resemblance. Very pretty vases. I wish I could have flowers in the house so I could collect treasures like that, but sadly I'm too allergic. Thanks so much for sharing at the Make it Monday Party! Hope to see you again next week. love little collections dictated by color!